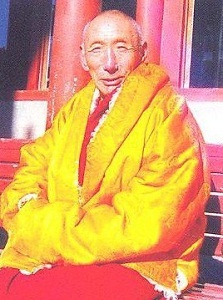 Gyawob Rinpoche was born in 1927 in Amdo Ngawa. He was recognised as the reincarnation of Khyungmong Tenpa Lodoe, who was the great master of Chinese Phowa Drongjug practice as well as the 21st reincarnation of Khyungmong Rinpoche. At the age of 7, Rinpoche entered the Nangzhig monastery and began his primary education until he completed all the monastic studies, such as reading, writing, recitation, chanting and so on. At the age of 11, he took the vows of novice monk from Nangzhig Kyabgon Namkha Lodoe, and was then named Tsultrim Tenzin Wangyal. In addition, Gywob Rinpoche also received teaching of Bon Sutra, Tantra, Dzogchen from Nangzhig Kyabgon Namkha Lodoe. At the age of 17, he received the empowerment, instruction and teaching of A-khrid, Nyengyu and Dzogchen from his uncle Sangye Tenzin, and in particular, he received teaching and empowerment of three mother tantras (Magyu Sangye Gyusum). As Nangzhig Kyabgon Tenpa Rabgye appointed him as the representative of Nangzhig monastery, Gyawob Rinpoche took the responsibilities to look after all the interior and exterior matters of the monastery. When the religious freedom was granted in the entire Tibet, Rinpoche also took initiative to open the door of Bon in the Nangzhig monastery. Taking a great hardship, he restored the religious objects such as, stupas and statues that were destroyed before and also built temples to place those objects. Rinpoche has contributed many activities in terms of developing the interior and exterior compound of the monastery. At the age of 63, he visited Khyungmong Yungdrung Phuntsok Ling, the main seat of Khyungmong Tenpa Lodoe. Rinpoche also gave empowerment, initiation and teaching of A-khrid, Nyengyud and Dzogchen to a large number of audiences there. In the same year, there was a serious draught in the nomads’ land due to the lack of rainfall. Rinpoche then helped the nomads by producing a rainfall with rituals like Klu mchod ‘o ma’i rgya mtsho (a ritual offering to Naga spirit) and Char ‘beb bdud rtsi ‘khyil ba (a rain making ritual). All the residents of that place were very delighted and the news spread all over Tibet , which made him famous in many parts of Tibet. Gradually, Rinpoche visited Lhasa, Beijing, Hrang-he and Hrin-tig. He gave there empowerments and instruction on the practice of Yungdrung Bon to a large number of students of Chinese origin. Thus he did great benefits to many sentient beings. In collaboration with Nangzhig Kyabgon, he established the Higher Education Centre of Yungdrung Bon Teachings and Practices at Nangzhig Monastery in 2001. When Rinpoche reached the age of 80, the concerned staffs of the monastery and general public followers organized a gathering to celebrate his 80th birthday. During that celebration, about ten thousand people were gathered there from different parts of Tibet to perform a long life prayer and ritual. After the ritual, the conference was held at the Nangzhig Monastery to discuss over how to follow, how to preserve, and how to propagate the doctrine of Yungdrung Bon; and in particular, how to restore and propagate the culture and tradition of Zhangzhung and Tibet. The conference was mainly initiated by Rinpoche and a hundred of participants gathered there includes, renown Lamas and Tulkus, distinguished scholars and high officials from all over Tibet. Thereupon, he donated all the money that he received as the 80th birthday present for the renovation project of Namgyal stupa. In this way, he also added another great contribution by renovating a religious support of veneration.